Comfortable and clean stay. Would like to see a larger TV in the main living area for group activities / enjoyment. Great location and facilities. A nice hotel and staff. 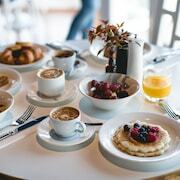 Nice room, nice breakfast. There was a mix up with our room, but they fixed it straight away, without any hassle. 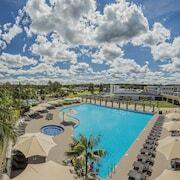 Located in a rural location, this family-friendly hotel is 5.6 mi (8.9 km) from Hunter Valley Gardens and 10.1 mi (16.2 km) from Hunter Valley Zoo. 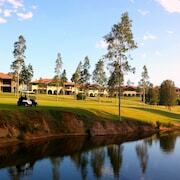 Our stay at Hunter Valley Resort was wonderful. Location was great, restaurant was great as were the staff. The room was confortable and clean every day. We will definatley be back. Dust was falling from the ceiling. Ceiling and walls were very dusty. Needed a very good clean. Reported the problem after first night and was told the room would be cleaned. Returned to the room to find the dust still all up the walls etc. Good hotel. Food at the hotel kitchen was not so good. If food and wine is your forte, you’ll fall in love with the Hunter Valley Wine Country, just like everyone else! Australia’s most visited wine region, it’s even better because it’s just two hours’ drive from Sydney. To go with all that tipple and gourmet food, the Hunter Valley dishes up a side of golf, spa pampering, quaint towns and totally fab landscapes. Feeling hungry? 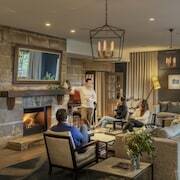 Get a taste of our great Hunter Valley Wine Country hotels, resorts and guesthouses! Home to a whopping 150 top-notch wineries, cellar doors and vineyards, and 65 restaurants to tuck into, the Hunter Valley has a number of great towns to explore it all from. Each is unique, but trust us when we say they’re all scenic. Speaking of that, the scenic drives through the region are totally fab! Wind your way down country roads past cellar doors and drop into those that take your fancy. If you’re not driving – and maybe that’s best (wink wink) – it’s easy to join a wine tour that’ll take you around the region. Some people even peddle their way around on bikes or soar high above it all in a hot air balloon! Pokolbin is considered the village centre of the Hunter Valley, so it’s always a popular spot to check out. While you’re here, don’t miss the Hunter Valley Cheese Company, Hunter Valley Smelly Cheese Shop and the Hunter Valley Chocolate Company. If you’d rather take home new skills instead of calories, the Hunter Valley Cooking School and Hunter Valley Wine School are brilliant. But don’t leave town without checking out the beautiful Hunter Valley Gardens, and if you’re a golfer you’ll defs love the championship course at Cypress Lakes. Cessnock is also a great base to explore from. While you’re there be sure to drop by the Historic Marthaville Arts and Cultural Centre, Werakata National Park, and the Convict Trail, the original road to Sydney hand-built by 3000 convicts. 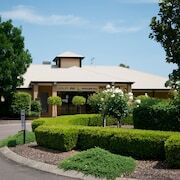 It’s also where you’ll find the Hunter Valley Visitor Centre! Singleton is also popular, and there you can check out the Royal Australian Infantry Corps Museum, go fishing on beautiful Lake St Clair, stroll around Bulgar Creek and see the ancient Aboriginal cave paintings of Baiame. One of Australia's most historic towns, Maitland is also part of the Hunter Valley Wine Region. Set on the Hunter River, you’ll just love the beautifully preserved sandstone buildings, the 19th century relics of the Victorian style Grossmann House, and the Gothic Revival style Saint Mary’s Anglican Church. The infamous Maitland Gaol is also fascinating! 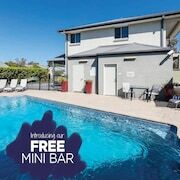 We also have great accommodation options in Kurri Kurri, Rothbury, Lovedale and Branxton. Wherever you go, you’ll never go hungry! Farm gate sales and fresh produce markets, quaint cafes and fine-dining restaurants are all a part of the Hunter Valley’s charm and allure. There are also plenty of events to keep you entertained, like the Hunter Valley Harvest Festival in March and April, the Jazz in the Vines show in October, and the Festival of Flowers from July to September. Are you ready for the pour-fect holiday? Get your sip lips ready and your buddies in tow for a road trip through foodie heaven. With world-class wine, gourmet food, beautiful scenery and other historic sights to catch, you’ll be more than satisfied. 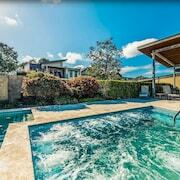 So lock in some Hunter Valley Wine Country accommodation below. We also have cheap flights to Sydney and flights to Newcastle too! And if you’re looking for a little inspiration first, check out how the lastminute lovelies enjoyed their time in the Hunter Valley on the live every lastminute blog!